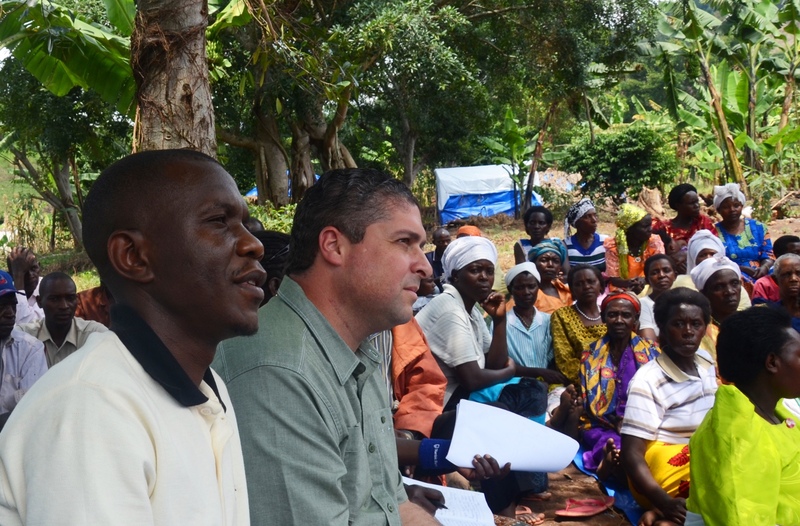 CAO Vice President, Osvaldo L. Gratacos (center), with Chris Baguma, a member of the local CAO team, at a meeting with the Mubende community in Uganda. CAO closed the case this year following implementation of mediated agreements between the community and New Forests Company (CAO). With casework spanning 32 countries, CAO has had a productive year. Our 2018 annual report speaks to our continued focus on delivering solutions, accountability, and learning across the CAO functions to improve IFC and MIGA project outcomes for local communities. Effective caseload management and building capacity in the CAO team are key aspects of our ability to deliver. We have worked hard on both fronts, with more than half of CAO’s 55 cases in monitoring following the conclusion of dispute resolution and compliance processes. Through these cases, we are heartened in many instances by the willingness and commitment of communities, companies, and IFC and MIGA staff to engage in a CAO process to address environmental and social concerns. Through dispute resolution, three-quarters of our cases have reached full or partial settlement. This includes new agreements reached this year in Albania, Cambodia, and Cameroon, as well as earlier settlements currently being monitored by CAO. To support this work, we have built a network of experienced mediators and this year hosted a summit in Kenya with CAO’s 27 global mediators to share knowledge and build capacity. CAO is also documenting good practice guidance on dispute resolution, which will be released in the coming year. CAO published six new compliance investigations of IFC investments in the mining, infrastructure, and manufacturing sectors. We closed compliance cases in Colombia and Indonesia after monitoring and acknowledged improvements in IFC’s procedures and practices. At the same time, we noted that project-level findings had not been addressed. Working with IFC and MIGA to develop a more effective approach to compliance responses and monitoring is a priority in the year ahead. IFC’s updated response to CAO’s Bujagali investigations earlier this year included timebound commitments to address project-level findings, which is a positive step. We have issued new advisory work on supply chains. This topic is important given the dependence of the private sector on global supply chains, combined with IFC and MIGA’s focus on fragile and frontier markets, where supply chain risks are likely to be most acute for clients. We hope to see uptake from IFC and MIGA on this and other advisory recommendations, such as CAO’s guidance on project-level grievance mechanisms, which was released last year. CAO met with over 300 organizations from 40 countries in Africa, Asia, Europe, and North America through technical workshops, policy meetings and outreach events this year. This included an Africa outreach initiative which, in addition to raising awareness about CAO, helped catalyze engagement between IFC and civil society groups. Given positive feedback, we believe the opportunity is there for IFC and MIGA to do more to engage civil society, particularly in the regions. In April, CAO formally launched its Approach to Responding to Concerns of Threats and Incidents of Reprisals in CAO Operations to address concerns about complainants’ safety. For the launch, CAO convened a technical roundtable during the World Bank Group Spring Meetings with guest of honor Zeid Ra’ad Al Hussein, UN High Commissioner for Human Rights. Many community members have shared with CAO their concerns about reprisal risk related to projects, which highlights the importance of proactively addressing this issue. CAO’s Approach is now available in English, French, and Spanish. As IFC and MIGA boost private sector investments in fragile and frontier markets under the World Bank Group’s “Cascade” strategy, it is important that CAO’s resources keep pace. This will allow CAO to continue being part of the Bank Group’s value proposition by providing effective accountability for IFC and MIGA environmental and social performance. Over the past year, CAO has engaged in discussions with IFC and MIGA management, the President of the World Bank Group, and the Board of Executive Directors on strengthening the accountability framework for IFC and MIGA, including CAO. We look forward to engaging CAO stakeholders in these discussions in the year ahead. In closing, I want to acknowledge the trust placed in CAO as an independent body by communities, companies, IFC and MIGA staff, and other stakeholders all over the world to help address sensitive environmental and social issues. Inevitably, there are challenges in this work and the accountability process can be lengthy, with uncertain outcomes. But through our interventions, CAO aims to deliver practical solutions that benefit local communities, enhance project operations, and improve IFC’s and MIGA’s overall performance. On behalf of the CAO team, thank you for your continued support as we work together to achieve positive environmental and social impact and keep communities at the forefront of the development agenda.